These Growth Stages Don’t Sound So Fun – Does That Mean You Will Be Losing Beard Hair Before You Know It? What About All This Hype of Minoxidil and Beard Vitamins – Is It Really Snake Oil? When I was a bit younger and my beard was coming in for the first time ever, I was concerned on several fronts. First off, it was coming in a bit patchy and to be quite honest I wasn’t too thrilled on about it. As a self conscious teenager, who would want a patchy beard anyways? 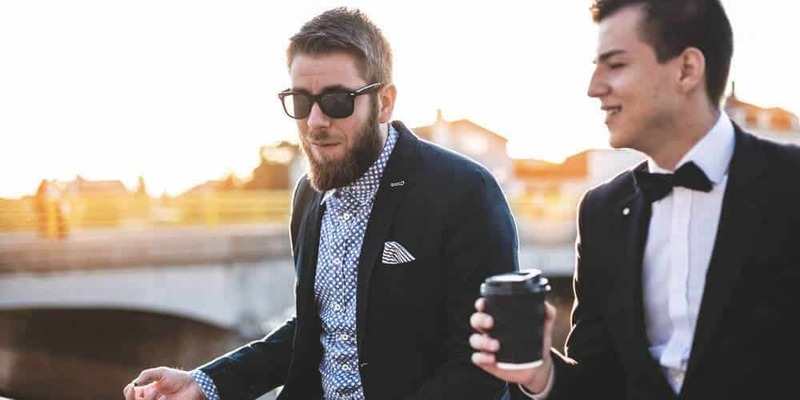 However, after knowing what I know about beards, and what I am about to share with you below – your facial hair goes through several different growth phases and growth rates, of which we will break down each one of those in detail. 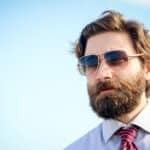 By the end of this post you will know how long it takes to grow a beard and a few hacks that can actually help speed up the growth of your beard! The hair that you have all over your body is formally referred to as androgenic hair. For men (and even women) this hair is going to develop during puberty (from vellus to androgenic). The actual growth of the androgenic hair all has to do with the amount of androgens that a man has. To be a bit more specific it has to do with the amount of testosterone in your body. So how then do hairs on your head vs your body hair differ? Your androgenic hair (facial/body hair) does actually follow a similar growth pattern to the hair on the top of your head, however, the phases of hair grow is the biggest difference. The first phase, anagen, is the one any sort of aspiring beardsman is going to love. When a androgenic hair is in the anagen phase, its going to be in growth mode. Typically for most of your body hair this growth phase lasts for a few months to a year. In comparison, the hair thats on your head can be in an anagen phase for several years. Let’s take a quick look at the hair thats on the top of your head. Your scalp hair can grow insanely long before it effectively hits a limit. For example, a mans hair on their scalp might not be able to grow more than a foot in length. Therefore your scalp hair might have a anagen limit of a few years before it moves into the next phase. 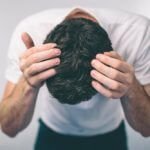 While your scalp hair might be able to grow insanely long, your body hair on the other hand as we mentioned earlier only has an anagen phase of a few months to a year. This is why your chest, leg, or public hair doesn’t grow out to a foot in length (thank god!). While a hair is in an anagen phase, it will typically grow about 1cm a month on average. 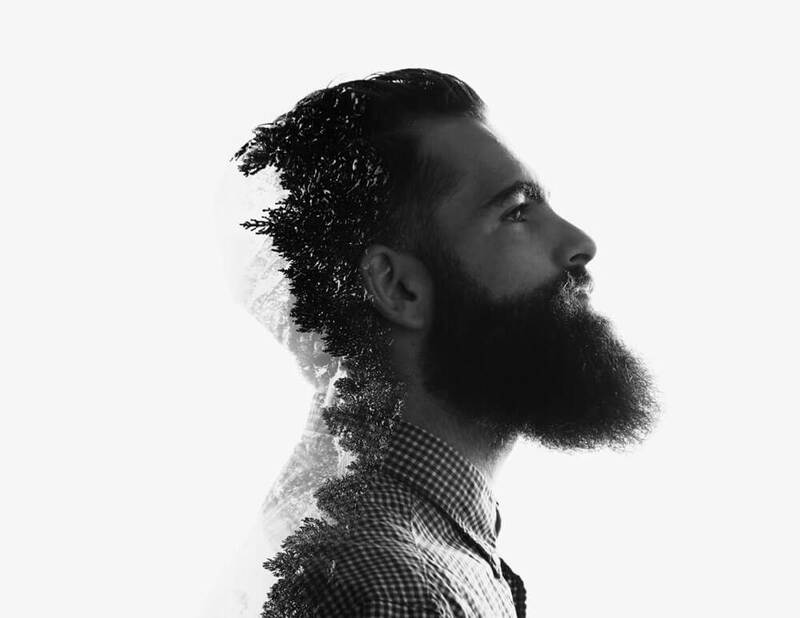 Therefore for your beard, if you grow an epic yeard it will likely be around 4.75″ in length as your facial hair has a bit more longer durations for the anagen hair. The next phase of the hair cycle is going to be the catagen phase. This phase isn’t nearly as exciting as the anagen phase, and to be honest, is quite boring. When your beard is in the catagen phase, pretty much your follicles are taking a break from all the growing it experienced in the anagen phase and is prepping itself to enter the telogen phase. 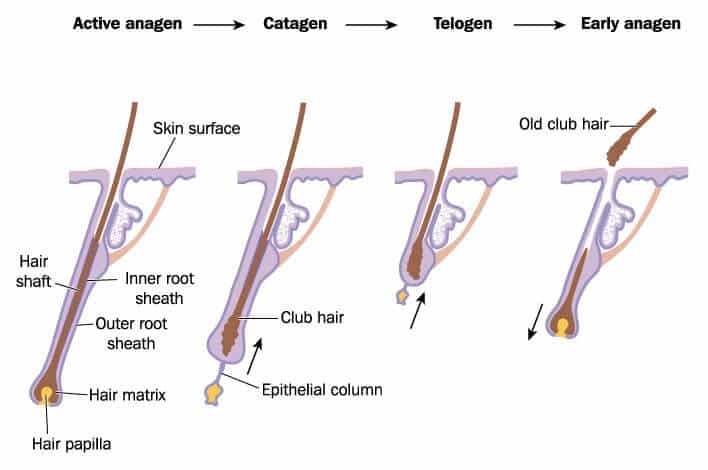 Your hair follicle will remain in a catagen phase for only a few weeks before its set to move over to the telogen phase. At this point your beard follicle has pretty much clocked in several days at the office and is ready to hang it up. During the last phase of growth, the telogen phase, your androgenic hair is just essentially resting and will be pretty dormant for up to about 4 months. Unfortunately no growth will be happening during this phase until the very end. The only purpose for the hair growth in this stage is to effectively shed from your body in order to make room for the next hair follicle that is coming in (transitioning back to the early anagen phase). 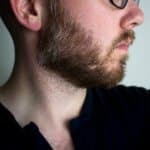 In fact if you are in your mid to late 20s (or later), chances are that your beard follicles have already moved through all the above phases several times. Not only that, but the hairs all over your body (and head), actually are all in different stages of life. This is why we all aren’t completely hairless every year or so and then start anew. Whether you are 12, 16, or anywhere in between, you will be going through puberty and will start to experience the first signs of facial hair growth. Typically most men will start to see mustache hair growth first and then some patchiness on your cheeks. During puberty your testosterone levels begin to rise and will ultimately transform the vellus hairs all over your body into terminal androgenic hair. After puberty your testosterone levels continue to rise and the anagen phase (the growth phase) begins to lengthen allowing you to start to grow a beard a bit quicker. With the additional testosterone more of the vellus hairs will transform into androgenic hairs and will begin to fill in the patches giving you a bit thicker and fuller beard. Lastly after the age of 25 until about 35, your body hairs will experience their longest anagen phase and therefore will be the optimal time to grow the thickest beard at the quickest rate possible in your lifetime. This is essentially your “beard prime” phase and one you should enjoy fully with a thick furry mane! While scrolling through Instagram, I see some pretty epic beards on there. What are these guys secrets to growing such a thick beard? Well there are a lot of factors at play, but one of the biggest ones is going to be the genetics you were dealt. Even within my own family its crazy to see how much facial hair growth differs from myself compared to my brothers! For instance my older brother has a bit of a patchier beard whereas I was pretty lucky and have one that is a bit on the thicker side (although I do have a couple distinct patches). However when looking at our lineage, there are other members that have an incredibly thick beards! So with that being said, there are just simply some things that are out of your control. 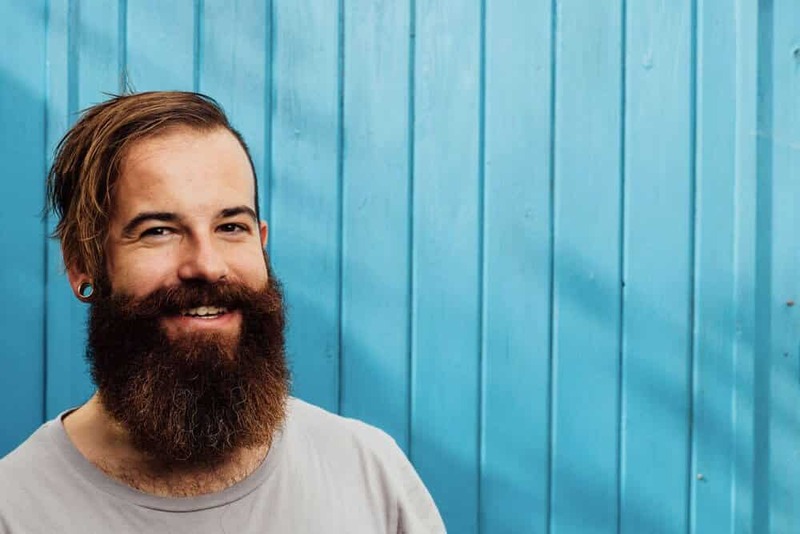 While growing a long beard is important, there are several things you can be doing right this instant to actually help grow it a bit thicker as well! 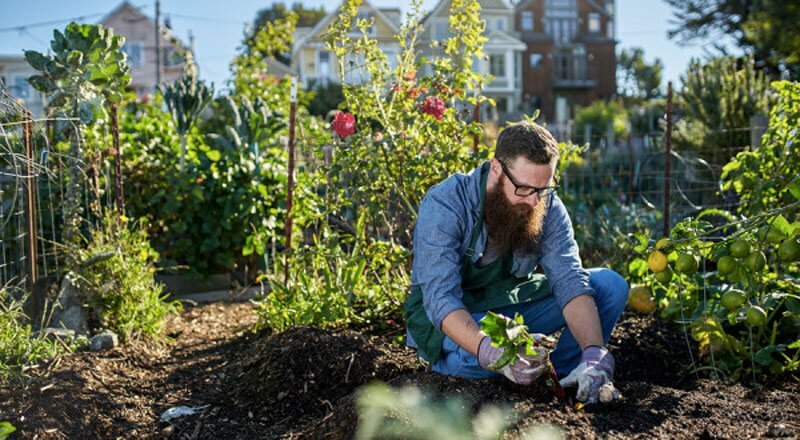 One of the most important things you can be doing while growing a beard (and for several other reasons), is to have a healthy diet. To be a bit more specific a diet that is rich in protein is one that will help beef up your beard follicles. Now one thing to note when introducing a higher than average level of amount of protein into your diet is that your nail growth will also speed up a bit. So don’t think you are crazy if you feel like you are cutting your nails on a more frequent basis – that is totally normal! Exercising Is Not Only Healthy – But Also Good For Your Beard! When you hit the gym on a regular basis and get in a good workout, you will up your testosterone level. With increased testosterone levels will help target your androgenic hairs and help them grow a bit faster and thicker. In addition to increased testosterone, exercising also helps circulate the blood flow within your body of which may speed up the growth of your hair as well. Lastly, regular exercise will help reduce stress levels. It has been widely documented that increased stress levels actually prohibit hair growth. Therefore a healthy outlet like exercising will be beneficial not only for your mind, but also your beard as well! Tying into the last section, to help reduce stress and ultimately give your body peak performance, make sure that you have plenty of rest on a daily basis. 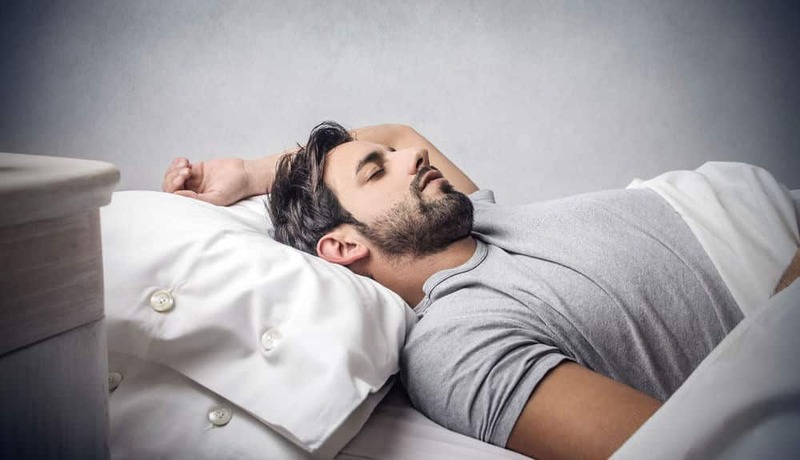 Therefore you are going to want to make sure you get at least 8 hours of sleep so your body and beard can catch up and be ready to start the day. With the recent beard explosion there are so many beard products on the market that its almost nauseating. From beard balms, oils, waxes, brushes, combs, and god knows what will come out next, does any of this have any real impact on the actual growth of your beard? If there is anything that is going to help with any sort of beard growth and the appearance of a thicker beard its definitely going to be the combs and brushes. Brushes specifically are great in making your beard appear a bit thicker and fuller with each stroke. Brushes can also do a great job in covering up any sort of patchiness helping you look even a bit more epic. Combs on the other hand are primarily for styling purposes and won’t nearly give you the appearance of a thick beard. But one trait that both combs and brushes have – is that they can help increase blood flow to your beard which in turn stimulates beard growth. While some sites might recommend massaging your beard (which sounds kinda lame), giving a good brush or comb over your beard will do even better and provide a even stroke that will help out your follicles. If beard growth is this important to you, make sure you use a top rated beard comb or beard brush so you don’t damage your follicles. Lastly when it comes to brushing or combing your beard, for heavens sake, don’t over do it. Over combing or brushing is a real thing and will damage your hair (even if you use the best brush or comb) and may even pull out some follicles. Now balms, oils, and to some extent waxes are only conditioners for your beard and provide no real growth benefits for speeding up on how long it takes to grow a beard. Beard balm and oils contain a few core ingredients, primarily carrier and essential oils that provide a terrific amount of moisture for both your follicle and skin. When I mention the benefits of beard oil to most novice beardsmen they usually scoff at the product thinking that its not necessary. They think its “manly” to grow a beard and never take care of it. However that couldn’t be further from the truth! When your beard gradually starts to come in, the skin will begin to dry out and ultimately cause beardruff. Beardruff if you aren’t aware, is simply dandruff on your beard. Its caused by your beard drying out your skin by sucking up all the sebum oil. Beard oil and balms act as a supplement to this naturally producing sebum oil and keep your beard moisturized and nourished. Simply put, beard oil and balms make your beard look healthy, feel soft, and smell pretty damn good. For a full review of the best beard oils on the market we invite you to check out our in-depth guide. We also have an in-depth review of the best beard balms that you should also check out! Alright if beard oils are the latest craze, what about minoxidil and beard vitamins? Minoxidil has been around for years and the active ingredient in the popular product, Rogaine. Its actually one of the very few hair growth products that are approved by the FDA and is readily available without a prescription. Minoxidil is especially great for beardsmen that are looking to solve their patchy beard problems. With its ability to be applied directly to the area of concern with the use of a dropper, minoxidil is the secret weapon for some beardsmen. Of course results may vary from one guy to the next and you should always consult your regular doctor should you have any questions about using a product like this. The more popular of the beard growth products is beard vitamins, the big names like Vitabeard or Beardalizer are seen everywhere online and are generally heavily marketed to aspiring beardsmen. These products are essentially multi vitamins with an emphasis on the core ingredient – Biotin. Biotin is a B complex vitamin that is typically found in several foods and was cited in a research study that was published on the NIH as perhaps helping spur on the growth of hair. Unlike minoxidil listed above, biotin is found in these beard supplements and must be consumed orally. Therefore if you have a patchy beard that you are trying to thicken up, you don’t have specific control through this method. However if you generally have a thinner beard, this could be a solution for you. Just like we mentioned earlier with the increase of proteins in your diet, with the increase of Biotin, you may experience increase hair and nail growth. So don’t be alarmed if your head hair or finger nails seem like they are growing a bit quicker. A quick important note about the use of supplements: They are supplements to your diet, not a replacement, therefore if you are eating a healthy balanced diet, you may not see any changes. However if your diet isn’t the best, this may be an alternative to help with beard growth. Just like with minoxidil, always consult your doctor if you have any questions. For a review of the top beard growth products click here. As you can see there is a metric ton of things that can directly impact the growth of your beard. From the phase your hair is in, to your age, genetics, diet, exercise, and so much more there really is a lot to consider. However with that being said, if you do have any questions about any section in particular, please drop a line in the comment section below and let me know! Until next time fellow beardsmen – beard on!